Oslob is a four hour drive away from Cebu city. The small town is known for its most famous attraction, the gentle giants or better known as whale sharks. Whale sharks in Oslob have become dependent on humans when it comes to food. Boatmen feed them everyday from early morning until noon. That’s why it is guaranteed that tourists can watch or swim with the whale sharks all through out the year in Oslob, Cebu. Swimming with the whale sharks is probably something an adventurous person has on top of his bucket list. It is truly a rewarding experience to see these beautiful creatures up close. 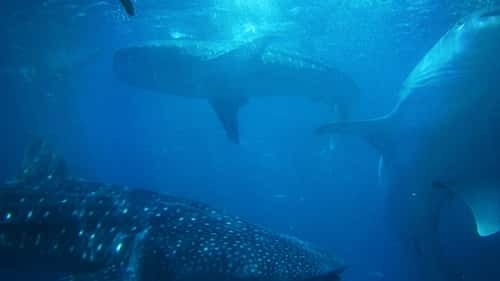 I swam with few whale sharks while keeping a safe distance, following them wherever they go as if I belonged to their pack. Once again, I felt so at peace being one with the ocean. What I experienced in Oslob is something that I will treasure for life. Every moment was full bliss yet the experience was also an eye opener. I saw how beautiful and harmless these gentle giants are and I want them to stay here forever so that more people can witness and appreciate the wilderness beneath the waves. The only way we can preserve any kind of marine animal is to not harm them. Honestly speaking, I am quite disappointed about the system at the tourism office in Oslob. They may be trying their best to implement the rules & regulations but I don’t think it’s strict enough. I saw some hasty tourists go straight to the cashier, pay and board the boat without listening to the mandatory orientation. The mandatory orientation is very important since it tackles the dos and don’ts such as no wearing of sunblock since it contains chemicals that are harmful to whale sharks, no flash photography, keep a safe distance and do not panic when a whale shark is approaching so as to avoid kicking it. If you’re planning to visit Oslob to see the whale sharks, please do observe rules no matter how excited and giddy you might get. If it’s your first time, make it also your last. The saying ‘once is enough’ is very applicable to this adventure. Admire them from a safe distance and help Oslob in preserving these beautiful creatures by spreading awareness and becoming a responsible tourist. Boatmen are excellent underwater photographers/videographers. They can operate almost any kind of camera, especially GoPro. Underwater cameras are available for rent if you forgot to bring your own. Snorkelling gears are included in the payment. You can ask your boatman to help you go deeper to the ocean to get a nicer shot with the whaleshark. Restaurants nearby serve delicious and affordable seafood. Do visit Tumalog Falls after the whaleshark encounter. It’s only a few minutes away and it’s a perfect way to cap off your Oslob adventure. Price for locals: Php300 per person (watching) / Php500 per person (swimming). Don’t forget to tip your boatman generously. How to get there: Go to South Bus Terminal in Cebu City and ride an Oslob bound bus (Php150). Tell the conductor to drop you at Barangay Tan-awan for the whale shark watching. Bus ride takes around 3-4 hours depending on traffic. It is recommended to leave Cebu City as early as 4am. Enjoy this once in a lifetime experience!